Blushing Willow is a one-of-a-kind bridal boutique offering brides a unique dress shopping experience where they can relax and be themselves. The boutique is located on the 4th floor of the Gray Goose, a former tobacco warehouse that has been completely renovated into a beautiful building in downtown Janesville. 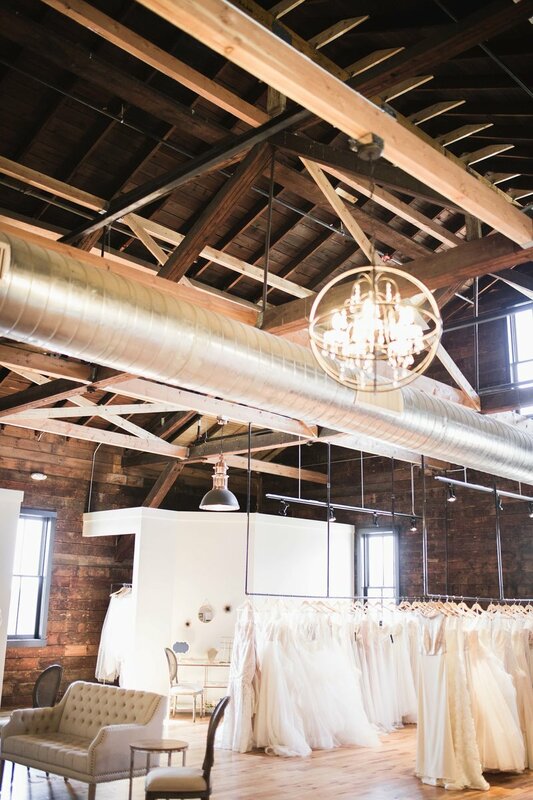 The space was designed to have a modern feel with vintage and industrial features to provide our brides with a comforting atmosphere while they shop. We hand select each dress in the boutique to ensure our brides have a selection of dresses that are fresh, new and unique. Many of our designers allow various alterations and customizations to their gowns so each bride has the opportunity to tailor her gown specifically to fit her own style and taste. During an appointment at Blushing Willow, the bride will have her very own consultant, who works with her every step of the way to find the perfect dress for her big day. Hi, my name is Kassie Strehlow and I am the owner of Blushing Willow. Prior to pursuing Blushing Willow, I studied Accounting at the University of Wisconsin – Whitewater and began my career in public accounting. The idea of opening a bridal boutique came mostly from my personal experiences. As my friends and myself became engaged, I quickly realized that dress shopping can easily turn into a stressful and daunting task, which shouldn't be the case. I've always had a passion for weddings and felt there was a need for a boutique that is accessible to our brides residing here in southern Wisconsin, offers quality gowns at a reasonable price and provides exceptional customer service. With this idea and my background in business, Blushing Willow was born.